The beach is amazing in its own right, but that doesn’t mean that your experience can’t be made even better. In fact, there are some practical items that can help reduce the impact of several beach-specific challenges, as well as accessories that can enhance the fun you’re bound to have by the water! 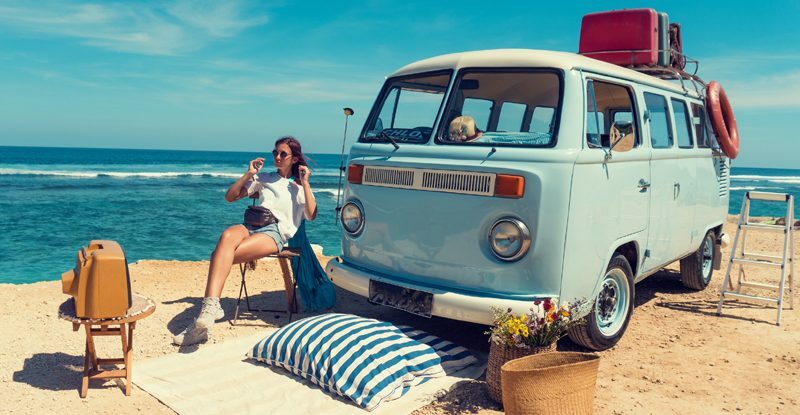 To help you make the most of your next beach trip, we’ve put together a list of the eight best beach accessories on Amazon. So, read on to discover your full sandy potential! There are chairs that you can use at the beach, and then there’s the Tommy Bahama Backpack Chair. Specifically designed for beach use, this chair has several features that make it perfect for your next ocean-bound adventure. It folds up and includes straps, allowing it to be easily carried as a backpack. It also includes an attached cooler, storage bag, comfortable headrest, and even a bar to hang your towel. Talk about convenience and relaxation! Everyone loves the feeling of the sand between their toes, but that experience has one huge drawback – the sand can be so hot that it burns your feet! Enter the VIFUUR Water Shoes, breathable, quick-drying slip-on shoes that are perfect for the beach. Whether you’re relaxing or engaging in more active waterside pursuits, these shoes will keep your feet safe, help your traction on the shifting sands, and dry before they can flood the floorboards of your car. For those who want to add a little action to their beach trip, Spikeball is the way to go. One of the fastest-growing play-anywhere games, it’s fun, fast-paced, and as competitive as you want to make it. Thanks to its compact design, it’s exceptionally easy to transport and carry. You only need four players, so gather a couple friends or use the free Spikeball app to find other nearby players! Where there’s a beach, there’s water, and where there’s water, there’s the possibility of your stuff getting soaked to the core. Thankfully, the Sak Gear DrySak is a simple, affordable, and surprisingly stylish solution to that problem. This bag is completely waterproof and features a large main compartment as well as a smaller zippered pocket for storing items like keys and IDs. Plus, its adjustable shoulder straps and reflective trim ensure you’ll be both safe and comfortable when carrying it. The elements are in full-force at the beach, so it’s important to be sheltered from them in order to stay safe and happy. The Sport-Brella Portable Umbrella functions as a large canopy, protecting you from the sun with its UPF 50+ fabrics. The design provides overhead coverage as well as side panels for added protection from the wind. It even has built-in windows so you can stay out of the elements but still enjoying all of your surroundings! Towels are a common sight at the beach. People use them to cover up, dry off, and act as a buffer between themselves and the sand. The problem with towels, though, is that they retain moisture and pick up large amounts of sand. The Camco Handy Mat eliminates these issues. It has built-in handles, making it less bulky and easier to carry than large beach towels. It also has pockets for storing your belongings as you test the waters. Best of all, it is durable and mildew resistant. It can even be cleaned quickly and conveniently with simple soap and water. Protecting your smartphone while at the beach is imperative, but exceptionally difficult. You need it for navigation, music, and photography, but don’t want to risk ruining your expensive lifeline to the world. Thanks to the Mpow Waterproof Bag, you don’t have to choose safety over convenience. Large enough to fit the majority of smartphones, the cases include handy bags that allow you to take your phone just about anywhere! Beach fashion never goes out of style, and the Lanzom Beach Hat is the quintessential example of classic beach fashion. Made of high-quality woven straw, this elegant hat is equal parts flash and function. Sure, it looks great, but it also manages to be exceptionally comfortable due to its lightweight, breathable construction. The benefits don’t stop there; though, this hat also provides protection from the sun, which is a vital trait when at the beach for extended periods of time.